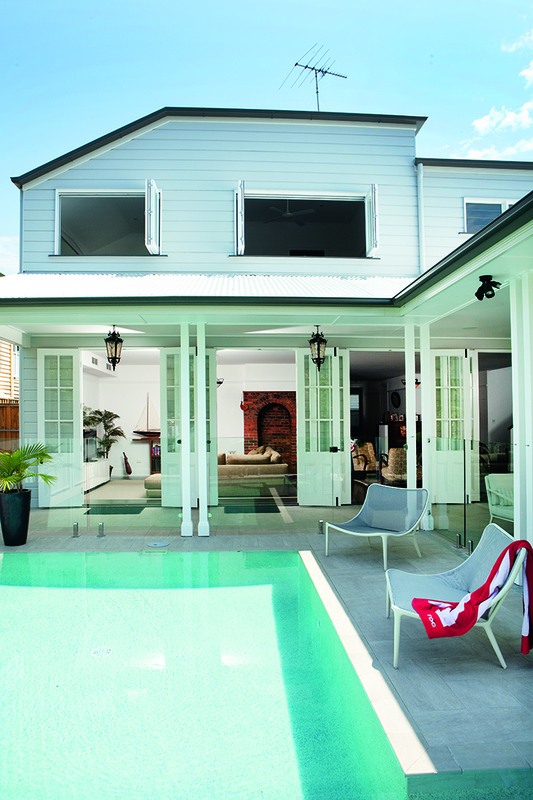 A renovated Ascot Queenslander home is a winning combination of sleek black floorboards, a fresh colour palette and pops of the tropics which have come together to create a truly magical result. 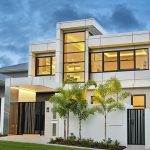 Your standard Queenslander renovation usually involves three key changes – an exterior repaint, a landscaping update and the installation of a modern kitchen and bathrooms. But the Morton’s renovation was far from standard. 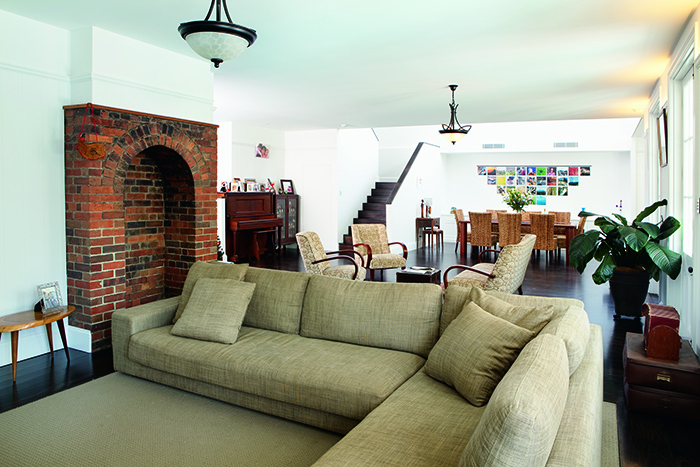 The fearless couple completely remodelled their 1901 home in a lightning eight months, maintaining many original features and the home’s heritage heart whilst also successfully re-configuring the home to suit a busy family of five. The high square set ceiling, an abundance of natural light and open plan design providing the sought-after characteristics of any modern 21st-century abode. However, a closer look reveals traditional architraves, heritage features and a rustic brick fireplace, immediately referencing a bygone era. The home is an exquisite example of functional, timeless design without the loss of the home’s historical heart. By selecting all tiles and flooring materials early on, Jennifer was able to calculate the dimensions required to ensure a perfectly even expanse of Japan Black floorboards, wool carpets and tiles throughout the home – a handy hint for any future renovator. Not only does the consistent flooring prevent any potential toe-stubbing, it creates a sense of flow and unity between the separate spaces. The kitchen is certainly the hub of the Morton household. Wide drawers discreetly placed below a built-in bench seat hide school bags, a hidden nook and filing drawer keep paperwork and newsletters organised whilst an uncluttered island bench, topped with New York marble from SNB Stone, allows Jennifer to simultaneously prepare dinner while assisting the kids with homework – a space fit for a true multi-tasker. 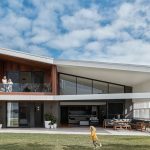 The seamless flow between the indoors and outdoors is another practical inclusion which stays true to the Queensland lifestyle. Soaring French doors in the home’s living area open up to a covered outdoor patio. 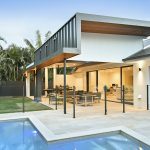 The modern outdoor setting from Dune Outdoor Luxuries provides the perfect family-friendly lounging area beside the much-loved pool, where outdoor movies capitalise on our glorious Queensland summers, courtesy of a ceiling-mounted projector. 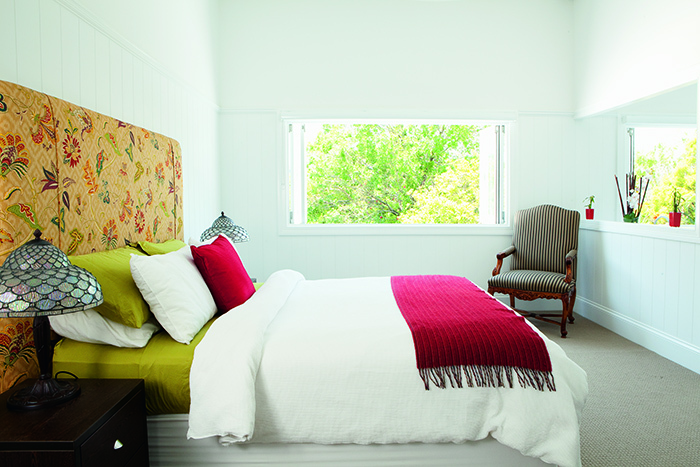 The master bedroom also has the potential to bring the outdoors in, where a wide set of windows peel back to reveal lush greenery and sky in the bedroom and above the large ensuite bath. 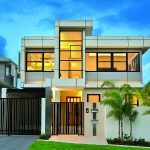 Open and inviting spaces, stylish outdoor area and sleek pairing of contemporary Australian style with hints of heritage add to this home’s unbeatable lifestyle appeal.